Is your pet drinking enough water? We humans often hear that we need to drink 8 glasses of water per day. What about your pet? How much is too much, or too little? I’ve been asked numerous times over the past few months this exact question- and I’ve finally found the time to get around to writing this. Most normal, healthy dogs require about 1 to 1.25 ounces of water per pound of body weight. That would mean a 10 pound dog would require between 10 to 12.5 ounces of water per day. (As a reminder, one cup of water is 8 ounces). An 80 pound dog would require between 80 to 100 ounces. (A gallon is 128 ounces). Of course, these are general guidelines. Your pet may require more water based on numerous outside factors which could include, but are not limited to: their activity level, weather/temperature or diet. One growing trend I have heard and read about recently alarms me. Some pet owners are restricting their pet’s water intake. Unless your veterinarian instructs you to withhold water from your pet, don’t do it. Some pet parents are doing this because of inappropriate urination in the house, or being woken up in the middle of the night by a pet needing to go outside. While these situations can be frustrating, withholding water from your pet is not the best solution. Unless directed by your veterinarian, your pet should always have access to a supply of fresh water. What is water obsessive behavior? If your pet is thirsty for long periods of time without access to fresh water, they may attempt to drink a full dish every time water is put in front of them- since it’s the only time they have access to it. If your pet drinks too much water in a short amount of time, this is a problem too. They may also begin seeking out other water sources- such as the toilet, outdoor puddles, or other inappropriate locations where the water may be contaminated with bacteria, chemicals or even intestinal parasites. If you are experiencing regular 2 AM wake-up calls from your pooch, we may suggest picking up the water 30-60 minutes before you go to bed, but no more than that. This will prevent them from loading their bladder right before bedtime. 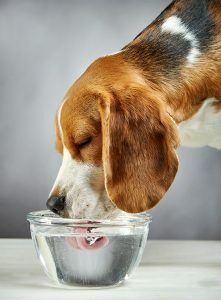 Remember that there are many medical conditions that could affect your pet’s thirst as well as their urination habits. diabetes, cushing’s disease, some forms of cancer, liver and kidney disease can all lead to thirst or dehydration. Medications to treat these conditions can also cause excessive water intake. Speak with your veterinarian if you notice an increase in your pet’s water consumption, as it could be an indicator that something is amiss. Don’t forget to regularly wash your pet’s water (and food) dish. You wouldn’t drink out of the same glass for days on end without washing it, would you? Your pet shouldn’t either.